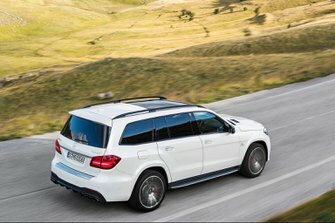 Mercedes-Benz GLS Performance, Engine, Ride, Handling | What Car? There’s no doubt the GLS leans towards comfort rather than agility. We’ve only driven the diesel so far, which never feels hugely fast, but there’s more than enough torque on hand to get its vast bulk and seven occupants moving from standstill swiftly. Decent mid-range urgency means accelerating through the gears is also stress-free. The new nine-speed gearbox flicks between gears without fuss and tends to use the pull available in the higher gears rather than change down at every opportunity. Refinement isn’t quite S-Class good, but the V6 is largely smooth and quiet when revved - aside from a little vibration through the steering column - and road noise at speed is well contained, even with our car’s winter tyres. There’s next to no wind noise. All GLSs come with four-wheel drive and adaptive air suspension as standard, with five driving modes that alter the gearbox, throttle response, steering weight, traction control and damper stiffness. There's ‘Comfort’, ‘Slippery’, ‘Sport’ and ‘Off-road’ modes, or the ability to mix and match your preferences using ‘Individual’. Our car was also fitted with an optional Active Curve System, which features anti-roll bars that also adapt with these modes. Ultimately the GLS is best left in Comfort; it does a good enough job of hiding its bulk in corners, and its steering is reasonably well set-up, but the class-leading Range Rover Sport has nothing to worry about in terms of agility. Sport mode makes your inputs more urgent, but hinders one of the GLSs best assets; its ride. In Comfort mode there’s the odd shimmy over very bad bumps, but it sponges away most large obstacles with ease and is remarkably settled on the motorway. Switching to Sport adds stiffness to the dampers and causes more jostling over cracks and potholes. Spending an extra £1985 on the Off-road Package brings more under body protection, a locking centre differential, low-range gearbox and three additional heights for the suspension that increase ground clearance and wading depth. A sixth ‘Off-road+’ driving mode also becomes available in order to take advantage of the extra capability. 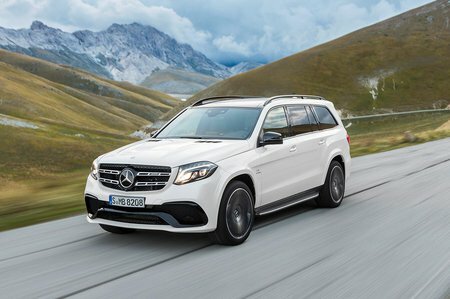 As with most large SUVs, the GLS will be more frequently seen traversing shopping centre car parks than rocky rural landscapes, but it can cope easily with deep snow and cambered icy surfaces in its Slippery setting.